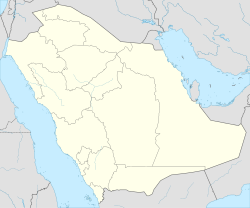 Hafar Al-Batin (ar:حفر الباطن) is a Saudi Arabie ceety in the Eastren Province an locatit in the Northeastren region. It is locatit 480 km the north o Riyadh, 90 km frae Kuwait border an about 70 frae the Iraq border. The ceety lees in the dry valley o the Wadi al-Batin, pairt o the lairger valley o the lang, nou-dry river Wadi Al-Rummah, which leads inland toward Medina an umwhile emptiet intae the Persian Gulf. In the 1st century efter hijrah in 638 CE, Hafar Al-Batin wis juist a route in the desert that pilgrims passed through frae Mecca for Hajj. At that time, there wis nae watter available in this land, the pilgrims travelled frae Iraq tae Mecca on a lang route athoot water. Durin Uthman ibn Affan's reign (644 CE - 656 CE), complaints o pilgrims reached Abu-Musa al-Asha'ari, a companion o the Islamic prophet Muhammad, who answered bi diggin for new wells alang this route in the Al-Batin valley. The name o Hafar Al-Batin (Arabic: حفر الباطن‎) is derived frae this which means "the hole o Al-Batin Valley". Durin the 1991 Gulf War Hafar Al-Batin wis targetit bi a barrage o Iraqi Al Hussein missiles on Februar 14, 1991. At least twa missiles hit the toun. An automobile wirkshop, twa hooses an five caurs wur destroyed. Fower ceevilians wur injured. In 2010, Hafar Al-Batin, haed mair than 35 veelages in its suburban aurie an the population reached 389,993. Aw the dountoun an roads o Hafar Al-Batin are paved. It is connectit wi an international netwirk o roads, connectin Saudi Arabie wi Kuwait in the East an connectin the North wi the Eastren Province. Hafar Al-Batin haes twa airports, Qaisumah (IATA: AQI, ICAO: OEPA) airport aboot 10 km in the east, an Keeng Khalid Military Ceety Airport (IATA: HBT, ICAO: OEKK) aboot 60 km in the sooth. The weather in Hafar Al-Batin ranges frae (-3 C tae 5 C) in winter nichts tae (40 C to 49 C) durin simmer days. The climate in general is hot an dry, an rains anerlie durin winter months. Wikimedia Commons haes media relatit tae Hafar Al-Batin. This page wis last eeditit on 10 Mairch 2018, at 20:30.